Background: Intrauterine contraceptive devices (IUCDs) are the most frequently used method of reversible female contraception worldwide, but their utilization varies considerably in different countries. Objectives: The objective of this study is to determine the pattern of use of IUCD, sources of referral, its associated complications and reasons for its discontinuation over a 10-year period. Materials and Methods: This was a retrospective study of all the women who sought contraceptive services at the Family Planning Clinic of the Lagos University Teaching Hospital over a 10-year period (January 1, 2006, to December 31, 2015). The case notes of these women were retrieved and relevant data extracted. Descriptive statistics were computed for the data, and results were presented in simple tables and charts. Results: A total of 1726 women accessed contraceptive services during the period under review with 521 (30.2%) choosing IUCD as their preferred method. A majority of the clients were aged between 30 and 34 years (34.5%) and multiparous (92.3%). The largest proportion of the studied clients (71.9%) had up to the tertiary level of education with the majority of the referrals coming from nurses (39.5%) and doctors (20.0%). The most common undesirable effect reported by the clients was abnormal vaginal discharge (40.8%) while 40.7% of the women discontinued the use of the IUCD prematurely. The most common reason for discontinuing the use of IUCD was the occurrence of an undesirable effect (44.8%). Conclusions: Our study revealed a modest decline in the uptake of IUCD among contraceptive users in Lagos. Health-care providers still appear to be the best source of information and referral as they play a crucial role in influencing women's acceptability of these services. Rapid population growth is still a critical issue in most developing countries. Slower population growth conserves resources, improves health and living standard. Family planning and contraceptive methods save women's lives by preventing unwanted and unintended pregnancies and also help to limit rapid population growth and poverty. Contraception includes all temporary or permanent measures designed to prevent pregnancy due to the act of coitus and an ideal contraceptive method should fulfill the following criteria – widely acceptable, inexpensive, simple to use, highly effective, and requiring minimal motivation, maintenance, and supervision. Intrauterine contraceptive devices (IUCDs) are the most frequently used method of reversible female contraception worldwide; however, their utilization varies considerably in different countries. More than 150 million women use IUCDs and this is mainly in emerging countries, particularly in Southeast Asia and in the Middle East. Findings from a 2011 study by Hubacher et al. showed that approximately 2.1 million American women use an IUCD, which is the highest level of use since the early 1980s. In Nigeria, it has been shown that IUCD is one of the four contraceptive methods that couples are commonly aware of. The contemporary copper intrauterine device is one of the safest, most effective, and least expensive contraceptives available. The IUCD is convenient and once inserted, it is nearly maintenance-free (except for the monthly self-checks to locate the IUCD string) for up to a decade. Only one follow-up visit to a healthcare provider after 1 month of use is suggested. The nonmedicated or copper IUCD has no systemic side effects, can be safely used by breastfeeding women, and rarely produces complications. It may offer noncontraceptive health benefits as well. The copper-containing devices act by causing intense local endometrial inflammatory response leading to decreased sperm and egg viability and also cause an increase in the mucus of users and lower sperm motility. With the levonorgestrel intrauterine system (LNG-IUS), in addition to an inflammatory reaction, progestin-release in long-time users causes glandular atrophy and stromal decidualization and creates scant viscous cervical mucus that hinders sperm motility. The LNG-IUS may also inconsistently release sufficient progestin to inhibit ovulation and also offers the additional health benefits of substantially reducing menstrual blood loss and pain and providing endometrial protection for women receiving estrogen replacement therapy during menopause or women receiving tamoxifen to treat breast cancer. The copper and hormone-releasing IUDs are effective contraceptives, and their ability to prevent pregnancy is similar overall to that of tubal sterilization. IUCD use is not without its side effects and associated health challenges. Wu and Buck in their study revealed a combined side effects rate of 11.7% for excessive bleeding, irregular menstruation, or abdominal pain among 1,192 first-time IUCD users and 0.2% became seriously ill due to faulty insertion techniques. They also revealed gross cumulative failure rates of 5.3%, 9.2% and 11.9% at the end of the first, second, and third year following insertion, respectively. The total gross cumulative discontinuation rates for these three time periods were 9.9%, 19.3%, and 28.3%, respectively. This retrospective study, therefore, was conducted at the Family clinic of the Lagos University Teaching Hospital (LUTH) to determine the pattern of uptake of IUCD, sources of referral, the associated complications and reasons for its discontinuation over a 10-year period (2003–2012). This was a retrospective study of all the women who sought contraceptive services at the Family Planning Clinic of the LUTH over a 10-year period (January 1, 2006 to December 31, 2015). The family planning clinic of the hospital operates from 8:00 am to 4:00 pm daily on weekdays. It is run by trained family planning service providers, which include nurses, resident doctors, and consultants in the Department of Obstetrics and Gynaecology. Resident doctors rotate through the clinic, attend to cases, and manage complications associated with various contraceptive methods in consultation with their unit consultants. The clients who had visited the family planning clinic and were offered IUCD during the period under review were identified from the clinic register. Their case notes were retrieved and relevant data such as age, parity, previous contraceptive use, reasons for change from previous contraceptive method to IUCD, desire for more children, reported complications, duration of insertion, discontinuation, and rationale for removal were extracted with the use of a standardized pro forma. The data were collated and analyzed using the SPSS version 20.0 Statistical Package for Windows (IBM Corp., Armonk, NY, United States). Descriptive statistics were computed for all data, and the results were presented in simple tables and charts. Ethical approval for the study was obtained from the hospital's health research and ethics committee before the retrieval of patient's data. De-identifying codes were assigned to the women's information for confidentiality. A total of 1,726 women accessed contraceptive services at the family planning clinic of the hospital during the period under review and out of these 521 (30.2%) chose IUCD. However, only 466 (89.4%) of these women had their detailed records available for analyses. [Figure 1] showed the yearly distribution of IUCD users with the peak year of use being in 2011. 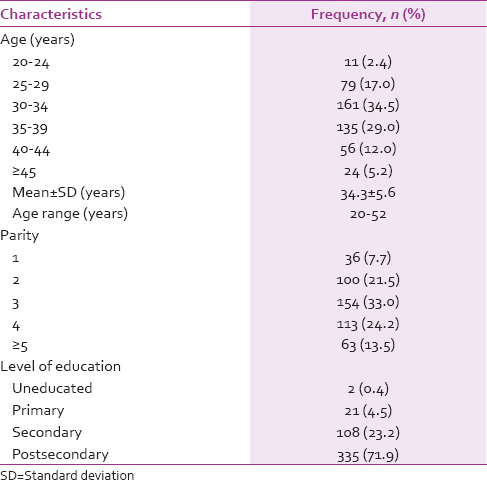 [Table 1] showed that the clients were aged between 20 and 52 years, and the mean age was 34.3 ± 5.6 years. The modal age group was 30–34 years (34.5%) and the majority (92.3%) were multiparous (parity ≥2). A large proportion of the studied clients (71.9%) had up to tertiary level of education, while 23.2 and 4.5% had only secondary and primary levels of education, respectively. All the clients who accepted IUCD were married. Among the IUCD users, 137 (29.4%) were not using any form of modern contraceptive before their IUCD uptake while the remaining 70.6% of the clients were previously using some form of modern contraceptives. Out of these previous contraceptive users, 124 (44.8%) were previous IUCD users who presented to the clinic for replacements while the remaining 153 (55.2%) switched from other forms of modern contraceptives to IUCD [Table 2]. 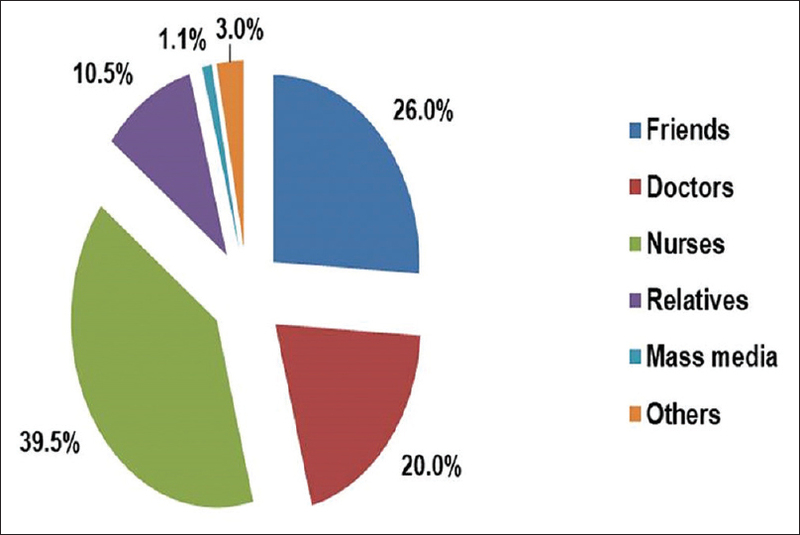 [Figure 2] shows the sources of the clients' referral, with nurses (39.5%) and doctors (20.0%) being the largest sources of referral. [Table 3] showed that 152 (32.6%) of the IUCD users experienced some form of undesirable effects in association with its use during the period of review. 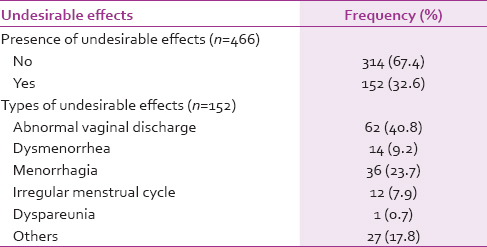 The most common undesirable effect reported by the clients was abnormal vaginal discharge (40.8%) while the least was dyspareunia (0.7%). [Table 4] showed that among the 466 IUCD users, 190 (40.7%) discontinued the use of the method prematurely within 12-month of insertion. The two most common reasons for discontinuing the use of IUCD were the occurrence of undesirable effects (44.8%) and the desire for another pregnancy (42.6%). Such unwanted side effects included pelvic pain, vaginal discharge, menstrual irregularities, expulsion and displacement of device, and failure of contraception. There was 1 (0.5%) case of intrauterine pregnancy [Table 4]. This study described the pattern of uptake of IUCD among clients attending the family planning clinic of the LUTH between January 1, 2006, and December 31, 2015. It was found that 30.2% of the clients in this study accepted IUCD and this uptake rate was similar to the finding from a review done by Okunade et al. in the same institution (31.6%); however, the study was smaller and covered only 3 years (2010–2012). This was, however, lower than the IUCD uptake rate of 58.2% reported by Adegbola and Ogedengbe from the same center in an earlier review covering between 1990 and 1994. Adeyemi et al. also reported a much higher uptake of 74.6% from another center in South West Nigeria which covered between 2001 and 2006. Just like our study, a similarly lower rate of IUCD use (26.5%) was reported by Mathurin et al. among the past or current IUD users in Martinique, France thus showing a possible shift in the pattern of contraceptive use not just in Nigeria but worldwide. It appears that the trend toward a progressive decline in the number of IUCD users became significant since 2011, and this most likely coincided with the period of massive promotion of the new forms of subdermal implants which probably translated to the clients' preferential uptake of these methods as opposed to the use of IUCDs. The age distribution of contraceptive users in this study is similar to the national trend reported in the Nigeria Demographic and Health Survey (NDHS) 2013. The peak age group (30–34 years) and nadir age group (20–24 years) of uptake of IUCD reported in this study correlated closely with a study done in the United States. Another similar study done in the same center showed that most of the clients (92.3%) who used IUCD were within the ages 20–39 years. This was, however, in slight contrast to the pattern of use of IUCD in different age groups in other industrialized countries, where a considerable change has been observed over the last 15 years. In the 20–24 years age group, use of IUCD as a percentage of total contraceptive use in 2006–2008 was almost 6%, which is almost similar to the older age groups. 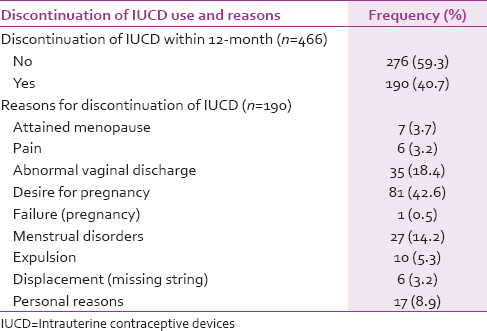 These use patterns suggest that an entire generation of women who did not consider IUCD for their contraceptive needs previously are now gradually embracing its uptake. Unfortunately, in most of the developing countries of the world, healthcare providers still often fail to offer the IUCD as a contraceptive option to adolescent and young adult women. In part, this is based on concerns that the IUCD is associated with an increased risk of PID and infertility, which would be particularly concerning in adolescent and young adult women. A large proportion of the clients in this study (92.3%) were multiparous, with 78.8% having between two to four children, which was almost similar to the finding from Osun study, wherein 70.3% of the clients also had between one to four children. This thus suggests that most women with this range of parity would consider their family size adequate and hence would most likely demand for family planning. The direct association between women's use of family planning methods and the number of children also indicates that women do not begin to use any form of contraception until they have had at least one child. The proportion of clients with at least postsecondary level of education (71.9%) in this study correlated with the study done in a similar urban setting in Ilorin, but was higher than the 23.8% obtained in Osun state and much higher than the 18.1% reported in a Pakistani study (18.1%). This suggests that more educated women were seen in this study because of its urban setting (Lagos, Nigeria). The increasing contraceptive usage with educational attainment in this study also corroborated with the NDHS 2013 finding and the Ghanaian study which found that educational status was the most significant predictor of a woman's use of contraceptive and thus educated women tend to appreciate the importance and benefit of use of family planning. Health personnel (nurses and doctors) accounted for the largest proportion of referral of clients for family planning and IUCD (65.5%). This is much higher than the reported finding from the Ilorin study where health personnel accounted for 36.3% of the source of information but very similar to findings from the previous studies done in the same center where most of the referrals were from nurses and doctors., This was not surprising as women generally put their faiths and trusts in the opinions of their care providers with regard to their health-seeking behaviors. Therefore, professional guidelines and routine competency training while on the job should be instituted for all contraceptive care providers to improve IUCD access as translating evidence into care will have a sustained impact on provider attitudes, knowledge, and counseling practices. Furthermore, the fact that only 1.1% of the IUCD users heard about the services through the mass media shows that more work needs to be done through this avenue to highlight the benefits of family planning. About one-third of the clients in this study reported one undesirable side effect or another in relation to their use of IUCD and the most common side effect recorded was abnormal vaginal discharge which could be due to vaginitis, sexually transmitted infection, or pelvic inflammatory disease (PID). The second most common undesirable effect in our study was dysmenorrhea, and this could be associated with a low-lying IUCD which has been reported in up to 17.0% of users. However, the greatest concern to most healthcare providers, PID, occurred in <1% of users, regardless of age or IUD type, but the risk of developing PID with an IUCD in place is similar to the risk of developing PID without an IUCD. This study has a few limitations. The poor record keeping system currently being used in the family planning clinic and the significant number of women lost to follow-up during the review period limited our data collection. Second, because the study was hospital-based and not community-based, the findings may not be applicable to the general population. Our study revealed a modest decline in the uptake of IUCD among contraceptive users in Lagos. Provision of family planning services is an issue of human rights, and healthcare providers still appear to be the best source of information and referral as they play a crucial role in influencing women's acceptability of these services. However, nationwide large-scale efforts still need to be instituted as a way of maximizing the important role that the mass media can play in an emerging world to influencing the improved uptake of IUCD especially among the younger contraceptive seekers. The authors appreciate the assistance and cooperation from the nurses in the family planning clinic of the hospital. Ikpeze OC, Etuk SJ. Abortion: Spontaneous and induced. In: Ikpeze OC, editor. Fundermentals of Obstetrics and Gynaecology. Onitsha: Africana First Publishers Plc; 2009. p. 117-90. Dutta DC. Contraception. In: Konnar H, editor. D.C. Dutta Textbook of Gynaecology. 5th ed. Kolkata, West Bengal: New Central Book Agency (P) Ltd.; 2009. p. 454-82. Nelson AL. Contraindications to IUD and IUS use. Contraception 2007;75:S76-81. Thonneau PF, Almont T. Contraceptive efficacy of intrauterine devices. Am J Obstet Gynecol 2008;198:248-53. Hubacher D, Finer LB, Espey E. Renewed interest in intrauterine contraception in the United States: Evidence and explanation. Contraception 2011;83:291-4. Oye-Adeniran BA, Adewole IF, Umoh AV, Oladokun A, Gbadegesin A, Odeyemi KA, et al. Sources of contraceptive commodities for users in Nigeria. PLoS Med 2005;2:e306. Rivera R, Best K. Current opinion: Consensus statement on intrauterine contraception. Contraception 2002;65:385-8. Cunningham FG, Leveno KJ, Bloom SL, Hauth JC, Rouse DJ, Spong CT, editors. Contraception. In: Williams Obstetrics. 23rd ed. New York, NY: McGraw-Hill Companies; 2010. p. 673-94. Wu T, Buck G. Side effects and discontinuation rates of intrauterine contraceptive device use in the Jilin Province of China. Asia Pac J Public Health 1998;10:33-8. Okunade KS, Daramola E, Ajepe A, Sekumade A. A 3-year review of the pattern of contraceptive use among women attending the family planning clinic of a university teaching hospital in Lagos, Nigeria. Afr J Med Health Sci 2016;15:69-73. Adegbola O, Ogedengbe OK. The acceptance rate of intrauterine contraceptive device (IUCD) amongst family planning clinic users in Lagos University Teaching Hospital (LUTH). Nig Q J Hosp Med 2008;18:175-80. Adeyemi AS, Adekanle DA, Komolafe JO. Pattern of contraceptives choice among the married women attending the family planning clinic of a tertiary health institution. Niger J Med 2008;17:67-70. Mathurin K, Volumenie JL, Flechelles O, Derancourt C, Bonnier C. Use and representations of intrauterine device in Martinique, F.W.I. : A cross-sectional survey. J Gynecol Obstet Hum Reprod 2018. pii: S2468-7847(18)30085-0. Family Planning. In: Nigeria Demographic and Health Survey 2013. National Population Commission (NPC) [Abuja, Nigeria] and ICF International [Rockville, Maryland, USA]; 2014. p. 89-115. Sulak PJ. Intrauterine device practice guidelines: Patient types. Contraception 1998;58:55S-8S. Whitaker AK, Johnson LM, Harwood B, Chiappetta L, Creinin MD, Gold MA, et al. Adolescent and young adult women's knowledge of and attitudes toward the intrauterine device. Contraception 2008;78:211-7. Oyedokun AO. Determinants of contraceptive usage: Lessons from women in Osun state, Nigeria. J Humanit Soc Sci 2007;1:1-14. Adebara IO, Ijaiya MA. 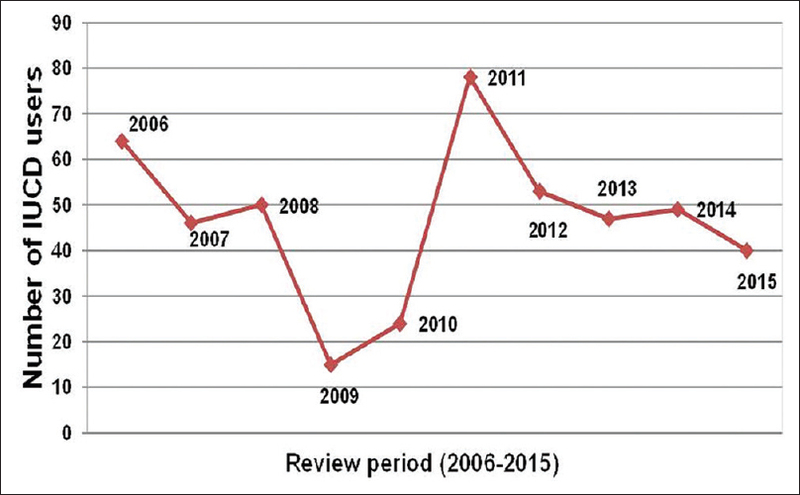 Recent trends in pattern of contraceptive usage at a Nigerian tertiary hospital. J Clin Med Res 2010;2:180-4. Raheelah A. Choice of contraceptive method among females attending family planning centre in Hayat Abad medical complex, Peshawar. J Pak Med Assoc 2012;62:1023-8. Adanu RM, Seffah JD, Hill AG, Darko R, Duda RB, Anarfi JK, et al. Contraceptive use by women in Accra, Ghana: Results from the 2003 Accra women's health survey. Afr J Reprod Health 2009;13:123-33. Emuveyan EE, Oshinyemi H, Durojaiye G, Dixon RA. Contraceptive choice in Lagos, Nigeria. West Afr J Med 1990;9:129-34. Thompson KM, Rocca CH, Stern L, Morfesis J, Goodman S, Steinauer J, et al. Training contraceptive providers to offer intrauterine devices and implants in contraceptive care: A cluster randomized trial. Am J Obstet Gynecol 2018. pii: S0002-9378(18)30222-9. Moshesh M, Saldana T, Deans E, Cooper T, Baird D. Factors associated with low-lying intrauterine devices: A cross-sectional ultrasound study in a cohort of African-American women. Contraception 2018. pii: S0010-7824(18)30095-7. Grimes DA. Intrauterine device and upper-genital-tract infection. Lancet 2000;356:1013-9. Trussell J, Vaughan B. Contraceptive failure, method-related discontinuation and resumption of use: Results from the 1995 National Survey of Family Growth. Fam Plann Perspect 1999;31:64-72, 93. Vaughan B, Trussell J, Kost K, Singh S, Jones R. Discontinuation and resumption of contraceptive use: Results from the 2002 National Survey of Family Growth. Contraception 2008;78:271-83.